The Aspen Companies announced today the $3 million acquisition of a 50-unit HUD supported apartment building in downtown Newark, N.J. The three-story rental building created in a converted factory is located at 75 Lock Street next to the New Jersey Institute of Technology and just blocks from the New Jersey Performing Arts Center. The red brick mid-rise building – which is 100% occupied — consists of a mix of one-, two- and three bedroom apartment homes. The Teaneck, N.J.-based Aspen Companies plans to institute an aggressive capital improvement program to the property, including upgrading common areas, hallways and exterior, improving building systems and renovating apartments. “Newark is rallying and we believe the rebirth will only get stronger in the years to come,” says Azi Mandel, a principal of The Aspen Companies. “Panasonic has opened the first new commercial building in the downtown district in more than 20 years. The long awaited Teacher’s Village, which features retail, housing and charter schools, was unveiled last fall on Broad and Market Street minutes from the 75 Lock building. One of the leading and most notable HUD owners and managers in the northeast, The Aspen Companies has garnered a strong reputation for its management style which focuses on significantly enhancing underperforming rental communities through capital improvement programs to upgrade building systems, modernize grounds and common spaces and renovate homes themselves and the addition of much needed amenities and social service programs. “We focus on distressed properties in urban middle-class neighborhoods where there’s a strong demand for quality housing that’s also affordable,” adds Adam Mermelstein, another Aspen Companies principal. “These apartment communities are exactly the type of value-added acquisition we seek. 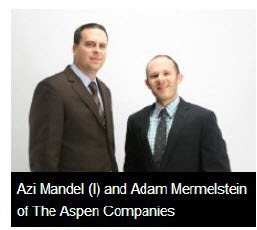 For additional information on The Aspen Companies, please call 201-379-5504 or visit http://www.aspencos.com.